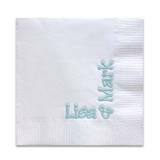 Custom monogrammed paper towels or paper hand towels are the perfect item in the guest bath when you have a party or company is coming over. Choose from our huge selection of hand towels -add a monogram or maybe a single letter. Perfect housewarming gift or maybe a thank you gift for someone special.